Financial innovation is here and it is here to stay. Financial advisors, broker/dealers, hybrids, and even financial planners should be thinking about how to adapt to inevitable changes launched by disruptive investing technologies. I have an unique perspective on technological disruption. For over ten years, my job was to develop software to make microchip designers more productive. Another way of describing my work was to replace microchip design tasks done by humans with software. In essence, my job was to put some chip designers out of work. My role was called (digital circuit) design automation, or DA. In reality my work and the work of software design automation engineers like myself resulted in making designers faster and more productive — able to develop larger chips with roughly the same number of design engineers. Robo Advisors: Infancy now, but growing very fast! “The robos are coming, the robos are coming!” It’s true. Data though the end of 2014 shows that robo advisors managed $19 billion in assets with a 65% growth rate in just eight short months. This is essentially triple-digit growth, annual doubling. $19 billion (likely $30 billion now), is just a drop in the bucket now… but with firms like Vanguard and Schwab already developing and rolling out robo advising option of their own these crazy growth rates are sustainable for a while. With total US assets under management (AUM) exceeding $34 trillion, an estimated $30 billion for robo advisors represents less than 0.1% of managed assets. If, however, robo advisors grow double their managed assets annually for the next five years that amounts to about 3% of total AUM management by robo advisors. If in the second five years the robo advisory annual grow rate slows to 50% that still mean that robo advisors will control in the neighborhood of 20% of managed assets by 2025. Another route to explore is the “robo friends”, or “full robo-hybrid” approach. This is partnering with an internal or external robo advisor. As an investment advisor, the robo advisor is subservient to you, and provides portfolio allocation and tax-loss harvesting, while you focus on the client relationship. I believe that the “robo friends” model will win over the pure robo advising model — most people prefer to have someone to call when they have investment questions or concerns, and they like to have relationships with their human advisors. We shall see. What matters most is staying abreast of the robo advisor revolution and having a plan for finding a place in the brave new world of robo advising. This entry was posted in Portfolio Optimization Software, Quants, Robo Advisors, Tax Optimization, Taxes and tagged financial automation, financial software, financial software solutions, software, tax efficiency, tax risk, tax strategies, Wealth Management. Bookmark the permalink. The Best Financial Models for Insight and Prediction? The best models are not the models that fit past data the best, they are the models that predict new data the best. This seems obvious, but a surprising number of business and financial decisions are based on best-fit of past data, with no idea of how well they are expected to correctly model future data. Instant Profit, or Too Good to be True? For instance, a stock analyst reports to you that they have a secret recipe to make 70% annualized returns by simply trading KO (The Coca-Cola Company). The analyst’s model tells what FOK limit price, y, to buy KO stock at each market open. The stock is then always sold with a market order at the end of each trading day. The analyst tells you that her model is based on three years of trading data for KO, PEP, the S&P 500 index, aluminum and corn spot prices. Specifically, the analyst’s model uses closing data for the two preceding days, thus the model has 10 inputs. Back testing of the model shows that it would have produced 70% annualized returns over the past three years, or a whooping 391% total return over that time period. Moreover, the analyst points out that over 756 trading days 217 trades would have been executed, resulting in profit a 73% of the time (that the stock is bought). The analyst, Debra, says that the trading algorithm is already coded, and U.S. markets open in 20 minutes. Instant profit is only moments away with a simple “yes.” What do you do with this information? You know this analyst and she has made your firm’s clients and proprietary trading desks a lot of money. However you also know that, while she is thorough and meticulous; she is also bold and aggressive. You decide that caution is called for, and allocate a modest $500,000 to the KO trading experiment. If after three months, the KO experiment nets at least 7% profit, you’ll raise the risk pool to $2,000,000. If, after another three months, the KO-experiment generates at least 7% again; you’ll raise the risk pool to $10,000,000 as well as letting your firms best clients in on the action. Three months pass, and the KO-experiment produces good results: 17 trades, 13 winners, and a 10.3% net profit. You OK raising the risk pool to $2,000,000. After only 2 months the KO-experiment has executed 13 trades, with 10 winners, and a 11.4% net profit. There is a buzz around the office about the “knock-out cola trade”, and brokers are itching to get in on it with client funds. You are considering giving the green light to the “Full Monty,” when Stan the Statistician walks into your office. Stan’s title is “Risk Manager”, but people around the office call him Stan the Statistician, or Stan the Stats Man, or worse (e.g. “Who is the SS going to s*** on today?”) He’s actually a nice guy, but most folks consider him an interloper. And Stan seems to have clout with corporate, and he has been known to use it to shut down trades. You actually like Stan, but you already know why he is stopping by. You know that the S&P 500 historically has over 53% “up” days, call it 54% to be conservative. So stocks should follow suit. To get exactly 23 wins on KO out of 30 tries is C(30, 23)*0.54^23*(0.46)^7 = 0.62%. To get at least 23 (23 or more wins) brings the percentage up to about 0.91%. So you say 1/0.091 or about one in 110. Getting all Mathy? Feedback Requested! Do you want to hear more from “Stan”? He is ready to talk about adjusted R-squared, block-wise cross-validation, and data over-fitting. And why Debra’s analysis, while correct, was also incomplete. Please let me know if you are interested in hearing more on this topic. Please let me know if I have made any math errors yet (other than the overtly deliberate ones). I love to be corrected, because I want to make Sigma1 content as useful and accurate as possible. 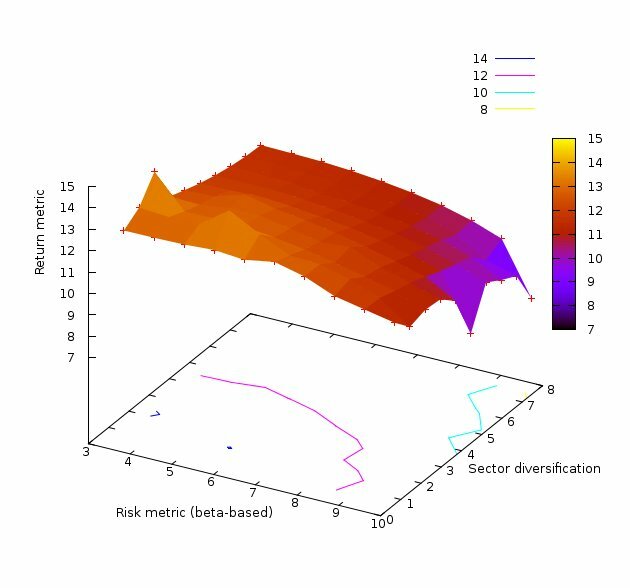 This entry was posted in Financial Analysis Software, Portfolio Optimization Software, Total Return and tagged financial automation, financial models, financial software solutions, quantitative finance, risk models. Bookmark the permalink. This plot shows the objective space and the trade offs between return, variance, and semivariance. It contains the same information present in other example plots, but presented from a different perspective. This entry was posted in Financial Analysis Software and tagged financial software, financial software solutions, portfolio analysis, portfolio-optimization software. Bookmark the permalink. In on-going beta testing, I have learned that investment professionals want more than answers to financial analysis problems; they want “solutions.” And each beta test has a slightly different definition for “solution.” The most common themes are 1) easy of use, 2) web-based interface. Beyond that enhancement requests start to diverge. Making software easy-to-use is not easy. It is one thing to train users on a product, it is quite another to build software that most people find intuitive. Nonetheless this is one of the Sigma1 software development challenges of 2013. Sigma1 is looking for additional expertise in this area. 2013 represents an opportunity for Sigma1 Software to incorporate feedback from our beta partners and transform HAL0 software from an optimization-engine into a more complete software solution suite. Thank you beta testers for your feedback! Sigma1 looks forward a continuing relationship that we hope will amaze you and your clients. This entry was posted in Financial Analysis Software, Wealth Management and tagged financial software, financial software solutions. Bookmark the permalink.